In October 1936, three Dublin firefighters lost their lives in a fire at the Exide Batteries shop on Pearse Street. On the night of October 5th 1936, three of Dublin Fire Brigade’s finest lost their lives when a routine fire on Pearse Street delivered a cruel surprise. Located within striking distance of DFB’s headquarters on Tara Street, a barber’s shop and hotel occupied Number 163; an Exide Batteries shop was located on the ground floor of 164, along with several vacant first floor offices and a family of seven on the top floor. The basement of Number 164 was home to a factory, where the batteries were manufactured and stored. 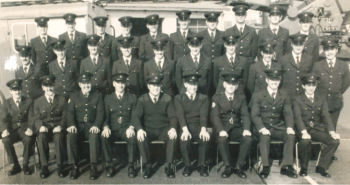 Writing in their seminal history The Dublin Fire Brigade, Tom Geraghty and Trevor Whitehead describe a dangerous scene – several gas cylinders on the factory floor, and a basement back wall modified with a timber and felt annex. “Housekeeping generally in the factory was poor and there were boxes, cartons and their inflammable contents thrown around the factory floor,” they noted. At 10.50pm that night, Thomas Kelly, who lived with his family on the top floor, spotted a fire in the building below. As he told the inquiry into the blaze the following year, he grabbed some clothes and evacuated his family from the building. Four minutes later the first crew from DFB arrived, with 12 men, a motor pump, turntable ladder and turncock. Despite all the equipment present, water supply posed an immediate problem with three hydrants failing to supply adequate pressure, and one onlooker described the pressure as “not enough to put out a bonfire”. Officers began the search for an alternative in nearby Merrion Square and Westland Row. Believing that the Kelly family was still trapped on the top floor, three firemen – Robert Malone, Thomas Nugent and Peter McArdle – had already entered the premises when an explosion rocked the building at 10.58pm. It was the last time they would be seen alive. A second explosion followed the first, and in the confusion that followed their absence wasn’t noticed for an hour. Malone’s wife passed the scene by chance, and stopped knowing that her husband would be involved. “Some seconds later there was a terrific explosion and I knew I would never see him again,” she later explained. The fire continued to burn until around 2.30am, with later reports suggesting that it had burned itself out rather than being extinguished. Once it had cooled, firefighters quickly entered the building, carrying out a frantic search for their missing colleagues. Despite the danger posed by the ‘smouldering debris and falling masonry’, the search continued until some time after 4am, when the first body was recovered from the rubble. It would be several hours before the remains of the other two men were discovered, aided by off-duty firefighters and members of the public. 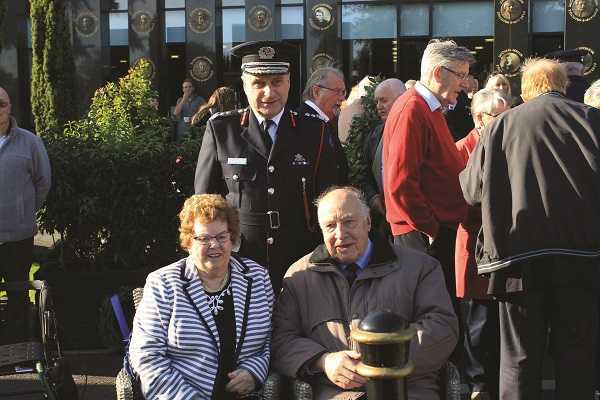 Eighty years on from that fateful day, the three firefighters’ lives and deaths were marked at a sombre wreath-laying ceremony in Glasnevin. 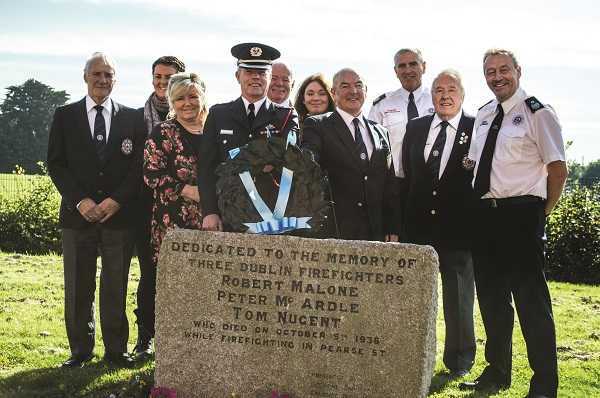 The ceremony was attended by a number of DFB personnel both serving and retired, as well as descendants of those three men, including Stephanie McArdle – Peter McArdle’s daughter. “Dublin Fire Brigade has been involved in a number of events in this, the centenary year of the 1916 Rising. However, this to me is the most sombre and reflective, both from a personal point of view and also the role that Dublin Fire Brigade performs in society, and the personal and high cost that can accompany this,” said Chief Fire Officer Pat Fleming, who spoke at the graves which lie side by side in Glasnevin. An immense outpouring of grief flooded Dublin city in the days that followed the fire and the deaths of Malone, Nugent and McArdle. Their coffins lay in state at City Hall and their funerals took place on October 10th, bringing the city to a standstill as some 50,000 people gathered to pay their respects. Alongside Lord Mayor Alfie Byrne and Taoiseach Éamon de Valera, a funeral cortège wound its way through the streets to Glasnevin Cemetery, pausing outside Tara Street fire station where the men had served before their untimely deaths. Malone’s coffin was draped with a tricolour – he had served under de Valera in D Company at Boland’s Mills during the Easter Rising, and had fought in the War of Independence; he was survived by his wife and two children. Nugent was engaged to be married, and McArdle left behind a wife and seven children. CFO Fleming with family members of the three firefighters, including Stephanie McArdle. In December 1936 a tribunal of inquiry was announced, sitting between January and March of the following year in a bid to determine the cause of the fire, any issues of negligence, whether the water pressure was sufficient to tackle the fire, the efficacy of the steps taken to extinguish the flames, and why the three firemen lost their lives. 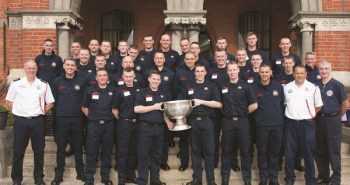 The recommendations reflected on planning regulations and Dublin Corporation, including Dublin Fire Brigade. As to the cause of the blaze, a number of theories were put forward and no firm conclusion was ever reached, though a cigarette was deemed to be the most likely cause. Exide Batteries was not found to have been in breach of the law, despite the presence of inflammable materials in large quantities and a failure to safely store gas cylinders. An issue between the fire brigade and the waterworks department was highlighted, with the question posed as to whether DFB had correctly notified the turncocks (those in charge of turning on the water for the mains supply), or if a crucial valve had not been opened by the turncocks. The truth of what happened never emerged. Dublin Fire Brigade as an organisation also came under scrutiny, with Captain Joseph Connolly enduring intense questioning. Water pressure gauges had not been checked before leaving the station, and the situation was likened to arriving for battle without any ammunition. The large turnout at the fire had meant that the rest of the city was left with very little cover. Equipment issues were also highlighted – firefighter Thomas Pott, who had survived the first explosion by jumping to safety on the flat roof of Number 165, had been issued with a cloth cap while new helmets were on order. For his part, Connolly noted that a better service could be provided with better resources. The tribunal’s report concluded that while individual officers and firefighters had acted bravely, there was a lack of supervision and direction on the part of senior officers, with the steps taken to combat the fire described as ‘inefficient’. The circumstances leading to the deaths of the three firefighters were noted as “sudden and violent explosions… increasing immediately the violence of the fire and creating a trap from which these men were unable to escape”. Among the tribunal’s recommendations was the reorganisation of the brigade along with a more regular system of drills, that the water supply in the city be improved, prohibition of the use of basements for industrial or factory purposes, and the introduction of regular government inspections. Reform would take place within DFB, and quickly. A year later Captain Connolly had retired and was replaced by ex-army Major J.J. Comerford, who set about restructuring the fire service, moving firemen and their families out of the stations, introducing new equipment and recruits and a range of other reforms and investments.